A true cat lover can easily create a list of the top things they like about their feline friend, but one trait that may not be on the list, is scratching furniture. Scratching behaviors can be very annoying for cat owners, but part of figuring out what to do requires knowing more about normal scratching behavior. Cats scratch with their claws in order to shed the outer layers of the nails. This makes the nails sharper. They also have scent glands on the underside of their paws so when they scratch an object, they place their unique scent there in addition to creating a visual mark. For cat’s wild cousins, this communicates the boundaries of their territory, but that’s not so important for house cats. Q: It’s been a bad year for me and money is tight. I have two rescued dogs and two rescued cats, all of whom aren’t getting any younger, though they’re healthy at the moment. Do you have any advice for saving money on medical care, food, grooming, toys and other pet expenses? – V.J., Orlando, Fla.
1. Pet insurance: As for all forms of insurance, this requires an investment (which not everyone can shoulder), but should something catastrophic occur, you’d be covered. Some companies pay up to 80 percent or more of the cost of care. 2. Create your own toys. For example, if you took your dog for a walk in the park near a tennis court just after dark, I’ll bet you’d find several gently used tennis balls. A plastic milk carton with a wine cork inside (or something else that makes a noise) appeals to many dogs. 3. Most pet food and cat litter companies offer coupons online. 4. Low-cost veterinary clinics do exist, most often associated with animal shelters. 5. Consider learning to groom your own animals; they won’t care if the results are less than show quality. 6. Buy the largest bags of pet food possible. For more ideas, check out “Barkonomics: Tips for Frugal Fidos,” by Paris Permenter and John Bigley (Riviera Books, 2010, $13.95). Note: At the time this column was published, used copies of “Barkonomics” were available through Amazon.com for a mere $7. Q: We recently adopted a 9-year-old cat. When we’re not home, our old lady loves to sleep. Butterball (who lives up to her name) seems so appreciative, like she knows we’ve given her this one last chance at love. We do have her on a diet, and it’s working. Her only bad habit is nibbling on plants. Should we be concerned? – H.H., St. Paul, Minn.
A: Many common houseplants are, in fact, dangerous for cats to ingest. For a complete list, go to www.aspca.org, then click on the tab for the Animal Poison Control Center under Pet Care, toward the bottom of the page. There’s also a video on YouTube presented by the director of the Poison Control Center on the topic; search on the words Poisonous Plants. Consider a manufactured deterrent you can apply to houseplants, such as Bitter Apple or Keep Away (available online and at pet stores). However, it would be far better, at least until you know Butterball has broken the habit, to simply remove the plants. Meanwhile, redirect Butterball’s chewing habit to safe roughage. You can buy cat grass at most pet stores and supermarkets, or online, and it’s actually healthy for cats. Also, periodically offer catnip, which you can also grow yourself. If Butterball is busy grazing on these acceptable alternatives, it’s less likely she’ll sample anything harmful. A: I’m glad you don’t want to amputate your kitty’s toes, which is what a declaw really is. Position those scratching posts adjacent to where the cat is currently scratching (presumably your furniture). Entice him using an interactive toy with feathers. When the cat bats at this, he’ll deposit his scent on the post, further enticing him to return there. Timing is important. Try this technique when your cat is excited. Another good time is when you’ve just arrived home from work after a long day. When the cat does scratch the post, offer treats and praise. Simultaneously, make the things your cat is currently scratching less attractive by placing plastic chair runners or cat mats (both nubby side up) over them. Steve Dale welcomes questions/comments from readers. Although he can’t answer all of them individually, he’ll answer those of general interest in his column. Send email to petworld@stevedale.tv. Include your name, city and state. OAKLAND, Calif. — When Jade Lenzo was getting ready to bring home her kitten, Bella, for the first time, she set about preparing the place for the little rag doll cat. Lenzo already had the essentials, but top on her list was a scratching post. Ostrofsky, who founded www.fivepetplace.com in 2004, recognized the need for fashionable pet furniture through his own experience. At the time, he was married and moving into a brand-new home. He and his wife had two cats, but the population quickly grew to five as they kept adding strays. The couple had worked and saved for the house; when they moved, they bought all new furnishings. The cats’ scratching posts and litter boxes stuck out like the proverbial sore thumb. Unable to find something that would suit the coffered ceilings, crown molding and wainscoting of his Union City, Calif., home, Ostrofsky worked with his father to build his own. He researched his own cats’ behavior and designed models that they preferred, but it was the enthusiastic response and requests from friends and guests that tipped off Ostrofsky that he was onto something. The line of cozy dog comforters and accessories is continually updated to coordinate with an assortment of bedding and décor for the entire home. So if you love the linens on your California king, Fido can have a coordinating ensemble. Robin Sheldon, its founder and president, says, “We are invested in creating lush, beautiful bedding for our customers to create their own soft surroundings. The salute to home décor does not come cheap, which may be the one sticking point for companies. But owners are accustomed to paying dearly for almost anything for their pets. Those who market the pedigree products point out that, yes, the items are costly, but they likely will last much longer than the more cheaply made versions. It’s the style that gets customers through the door, Ostrofsky says, but if it doesn’t function properly, they won’t be back. There’s also another factor that influences shopping for high-end pet furniture: How does the pet like it? It’s never too late to teach your dog how to act more humanlike – with the right device. 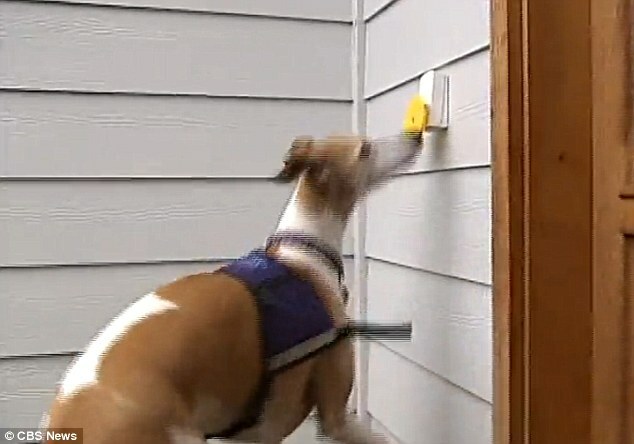 One man’s greyhound kept scratching at his doors to get outside, so he invented a ‘doggy doorbell’ to keep it from ruining the wooden doors around his home. 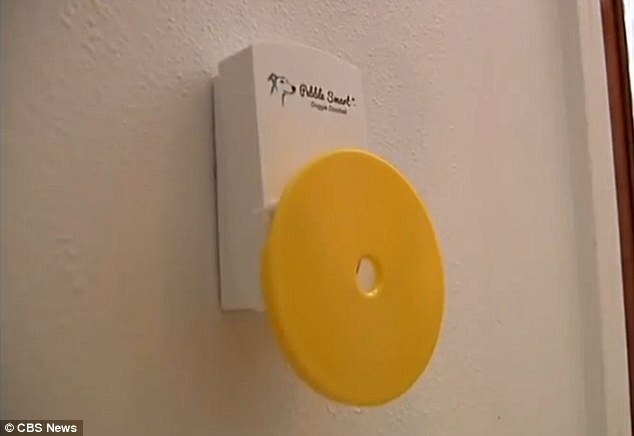 Keith Jin of Eugene, Oregon, invented the device to allow his dog Pebble to better let him know when it needs to go outside and get back in, KVAL-TV reports. 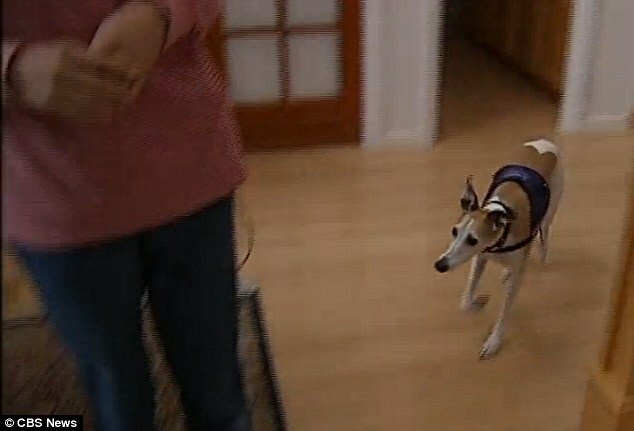 The portable, mountable device, which Jin named ‘Pebble Smart,’ rests on the inside and outside walls by his front door at about the same height as Pebble’s elongated snout. It has a big yellow pad with a space behind it to insert treats. That is how Jin trained Pebble to use the doorbell. Now Pebble knows the best way to get her owner’s attention when she needs to go outside. The ‘Pebble Smart’ doorbell has been so successful, Jin told KVAL that he is looking to create doorbells for other domesticated animals. With temperatures expected to fall below freezing across many parts of the UK, PetNet, which is supported by the British Veterinary Association, is urging pet owners to be aware of the huge risks associated with antifreeze. Antifreeze (containing Ethylene Glycol), commonly used in radiators and some screen washes, can make its way into puddles. Unfortunately dogs and cats like drinking from standing water and if the water is contaminated it will be appealingly sweet. The lethal dose is only the equivalent of a 6ml teaspoon. If owners have any more concerns about a pet’s health, they should visit http://www.petnet.co.uk for advice. Vets are online weekly giving advice but owners can register questions at any time. PetNet is a busy online community for pet owners with two website zones – Park Bench for dogs and Scratching Post for cats and on average 80,000 owners visit the site every month for advice. PetNet also has facebook pages with the same names, which have 85,000 highly engaged fans.